Copyright, 1893, by F. J. Tierney. Words and Music by F. J. Tierney. She was loved by Dan, honest hearted boy. And Consent was given by her father full of joy. And he gave his pretty child, with tears and a sigh, to Dan. 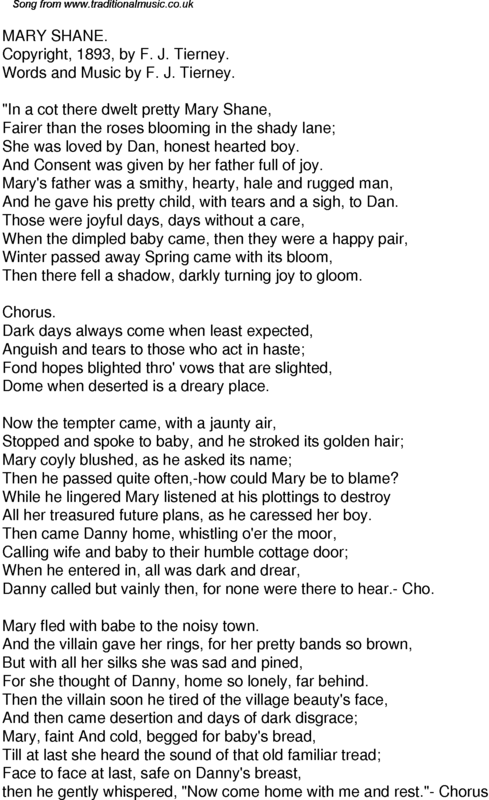 Then there fell a shadow, darkly turning joy to gloom. Dome when deserted is a dreary place. Then he passed quite often,-how could Mary be to blame? All her treasured future plans, as he caressed her boy. Danny called but vainly then, for none were there to hear.- Cho. Mary fled with babe to the noisy town. For she thought of Danny, home so lonely, far behind.